I made fish and chips, ages ago now, but have been so easy distracted by work, people, laundry, paperwork, and sleep, that I haven’t been able to get myself, my camera and my computer to have some focused alone time to be able to load, crop, and write these ideas and meals down. I made fish’n’chips for Sunday, the Patriots were playing St Louis in London. See where I’m going…? Yeah, themed, if you will. Only slightly tacky. 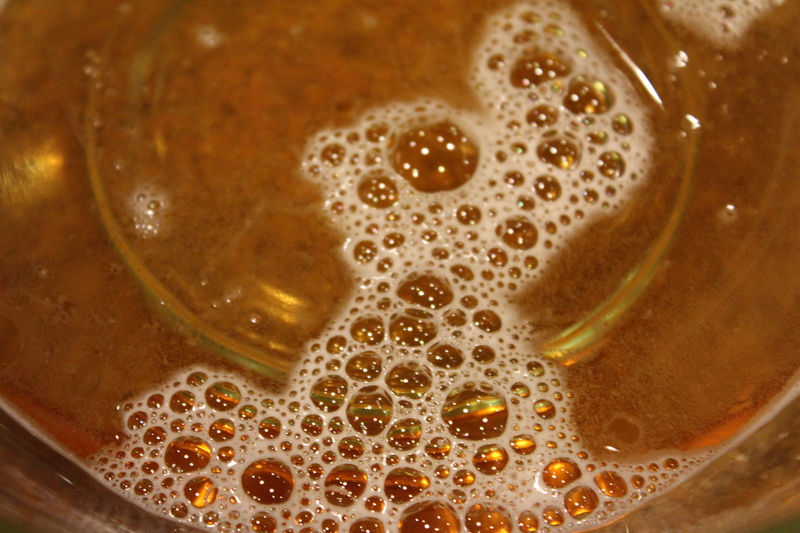 I had enough grolsch (I clearly need to find out how to spell this lager’s name, and so I used it to make my beer batter, because the other option was Sam Octoberfest, and that seemed, too heavy on flavor. I don’t like the ideas of themes, parties I’ve been to seem tacky and obnoxious, decorating and most chachkies too severe, it’s just too much for me, I felt like it was almost safe to cook in a theme, and had I not felt like I had to fully disclose why I chose to cook this… you’d never have known that I feared themes. Grolsch, my friends. It’s a lager. It’s tasty. 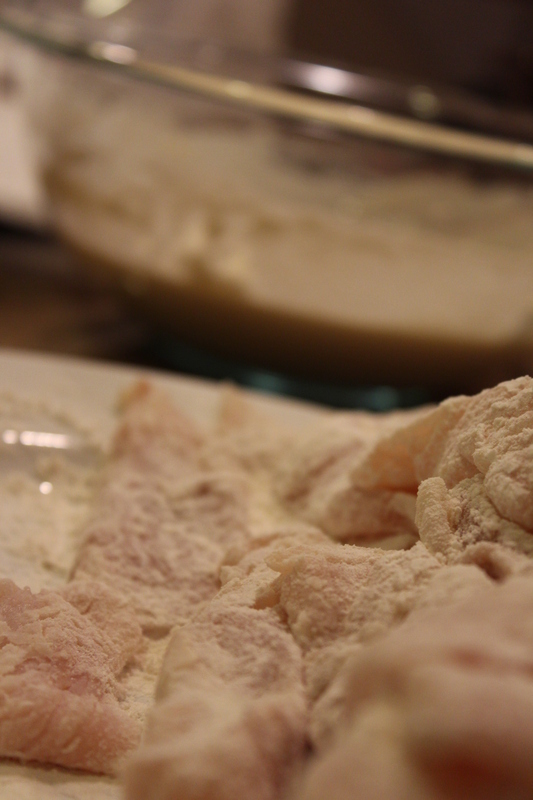 It makes a very good beer batter, doncha know. 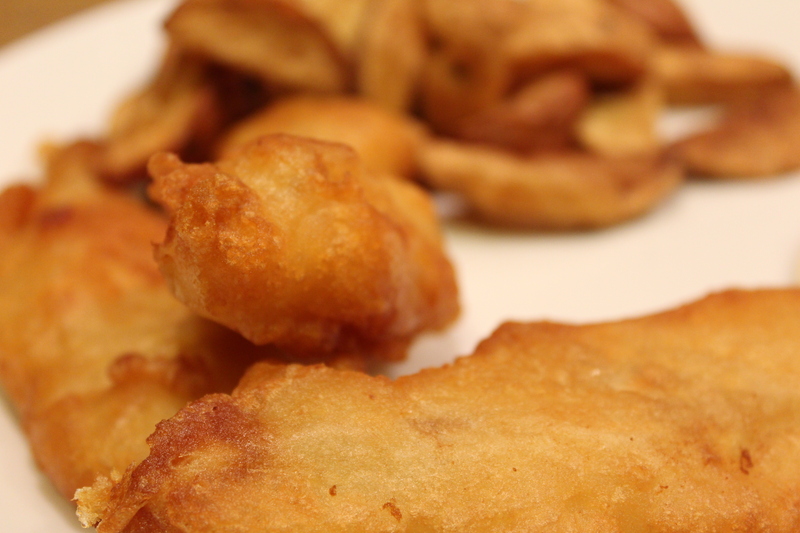 I had never made a beer batter, but I’d seem them a million times (on cooking shows, mostly) and had always wanted to try it. I saw this one while I was looking for the best way to make fish and chips, and decided it was what I was gonna do. My options for beer on hand, were either grolsch, or sam’s Octoberfest, very obvious choice there – I went with the lighter beer. I can only imagine that using the Octoberfest would’ve ruined my taste for it forever. 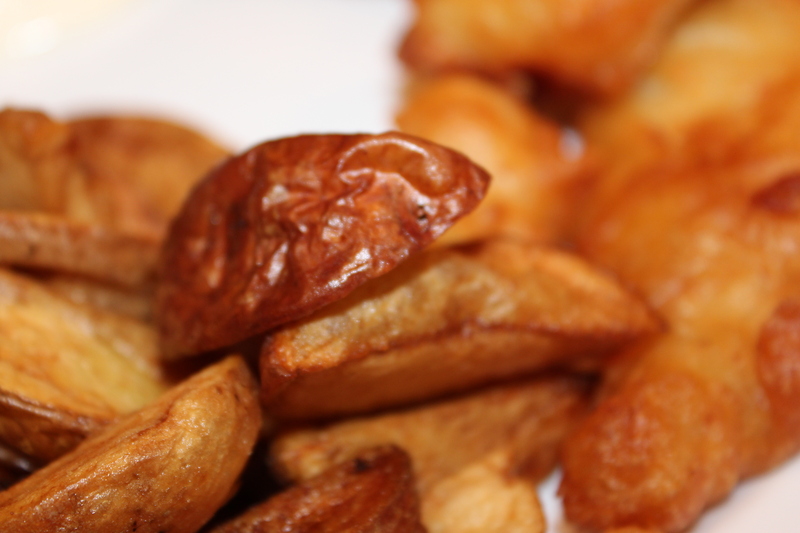 In a Dutch oven, heat several inches of oil to 375 degrees F.
Fry potatoes until golden brown, roughly 10 minutes removing with a slotted spoon. Hold food in oven (heated to 210-225) to keep warm while cooking the fish. For the fish, pour beer into a large bowl. 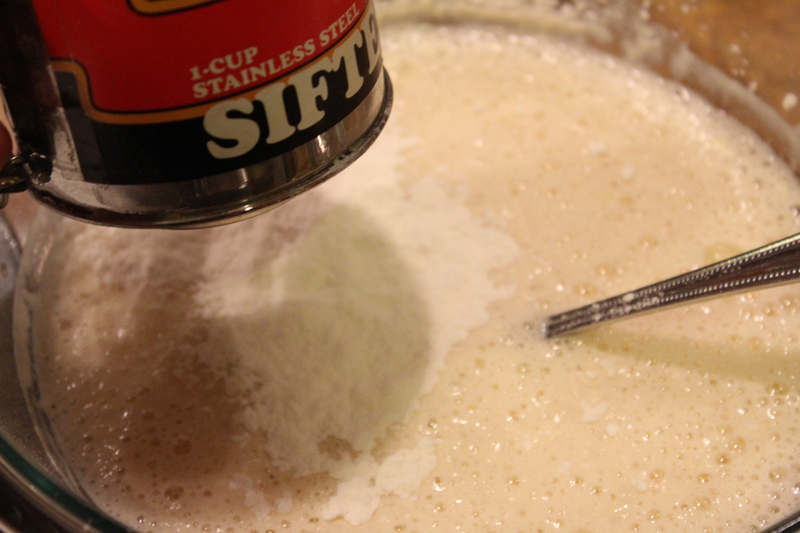 Sift the 1-1/2 cups of flour in, whisk gently until it’s just combined. Stir in seasoning. Pat the fish dry and season both sides of it with salt and pepper. Apparently I dredged at the wrong time. And oddly enough, I’ve just recognized it now as I write this down again. 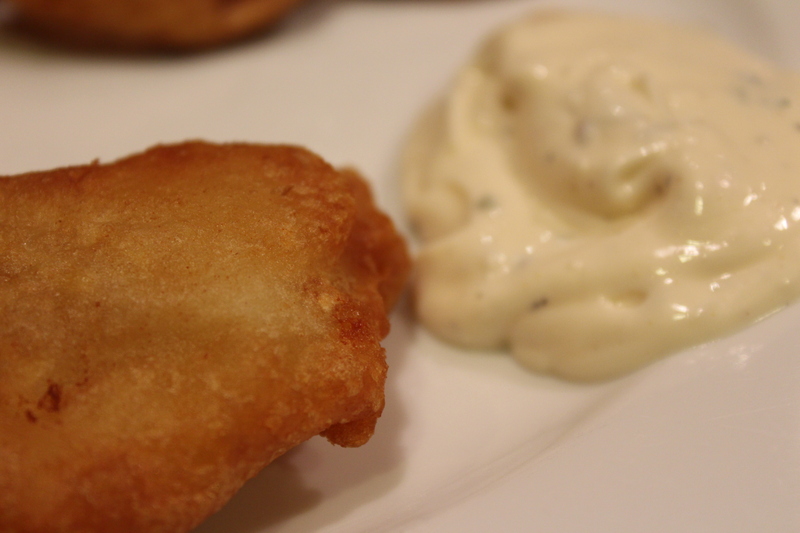 I dredged first then coated with beer batter…? Paula Dean says to batter THEN dredge. Hmmm. Some day when it’s warm enough to have the windows open while frying (because the smell of oil hangs so well in the air…) I’ll have to see what the difference is. Gently put fish into the oil, so you don’t burn yourself, or make a huge mess. 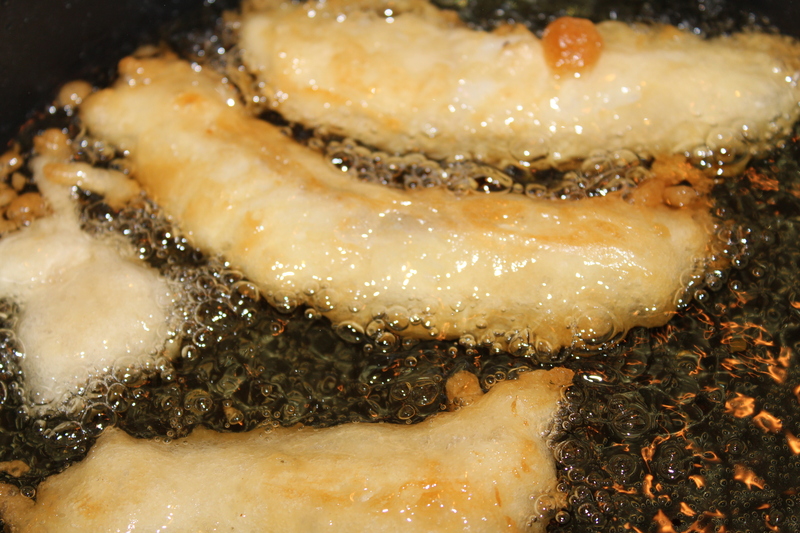 Fry the fish for about 5 minutes, until it’s a deep golden brown – turn it over frequently so it can cook evenly. Once cooked, transfer over to a paper towel on a baking sheet and keep it warm in the oven with your chips until you have finished the other batches of fish. Make sure your oil returns to 375F between each batch. 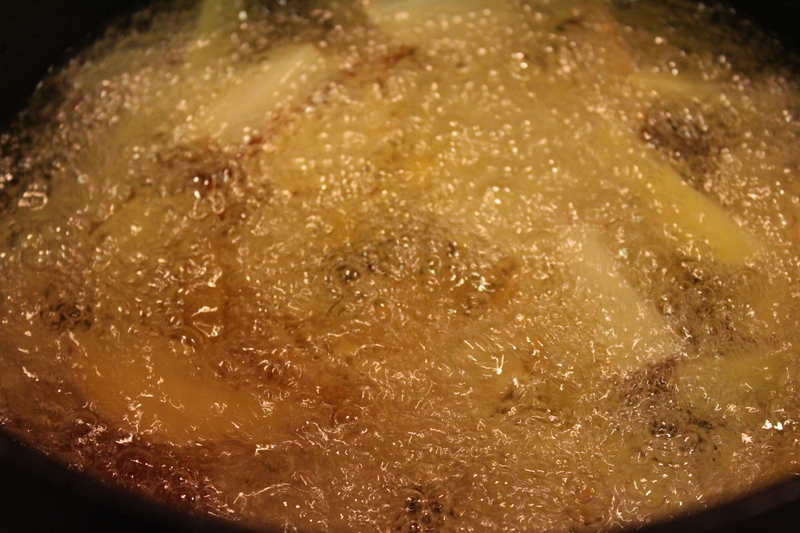 While you are waiting for the oil to return to your 375F, you can clean out the oil with your slotted spoon, so that the little drips don’t get all oddly caked onto the freshly battered pieces of fish as you drop them into the oil.